Whenever you are far away from your love and want to make your presence felt, you can send this heart-shaped Chocolate cake. Even if you are abroad, you can still send the cakes to Jaipur and all major cities of Rajasthan for that matter. Giftjaipur is an amazing service that is always ready to bridge the gap between you and your loved ones. Order this cake at giftjaipur.com and we will offer cake delivery atthe doorsteps of your loved ones. 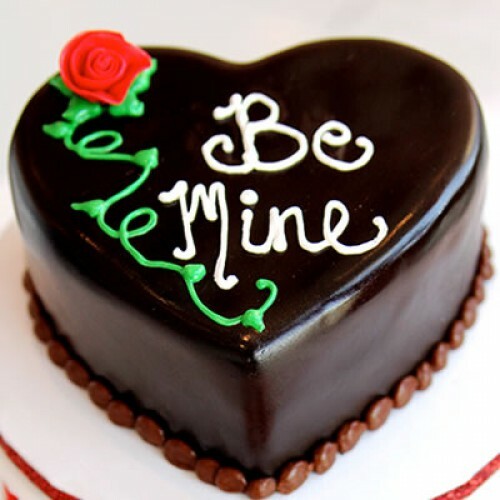 Make every occasion special by sending cakes to your beloved. •	Celebrate the special occasions of your dear ones with Creamy Chocolaty cake gift and wishes. The sweet crunchy taste of the cake will be enjoyed by your love and will be cherished forever. •	You can customize the cake by increasing/decreasing weight and size of cake as per your need.